Looking to have a unique and memorable experience at your next event or birthday party? 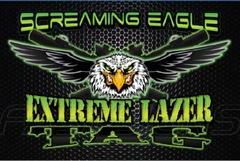 You will want to try our Screaming Eagle Extreme Laser Tag! We bring laser tag to you, day or night! Using our high-tech laser tag rifles, this experience is sure to make your event exciting and memorable. Our laser tag guns include optical and audio feedback for each participant. Our Extreme Laser Tag is perfect for all ages, including adults. All packages include: 1 Extreme Laser Tag Commander on duty, up to 50 guns with bands, and bunkers.